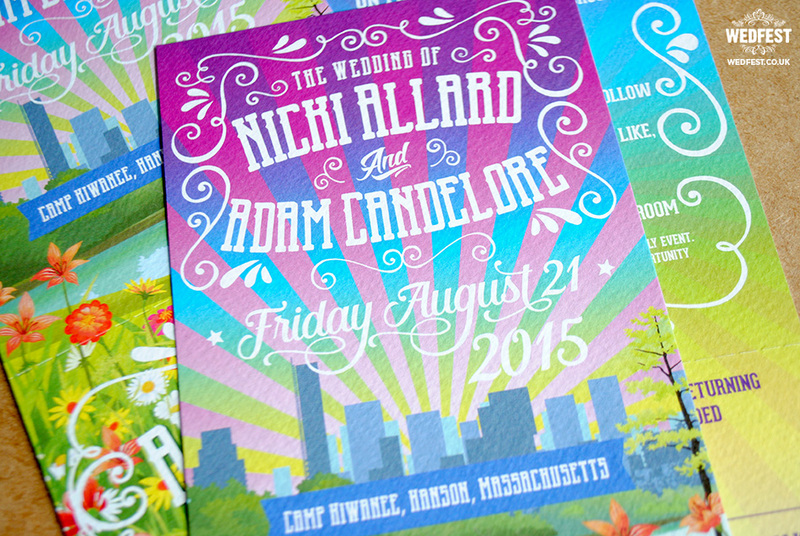 Camp Kiwanee Wedding Invitations and Wedding Wristbands – We have been looking forward to posting this wedding stationery on the website from the moment it was designed many many months ago. 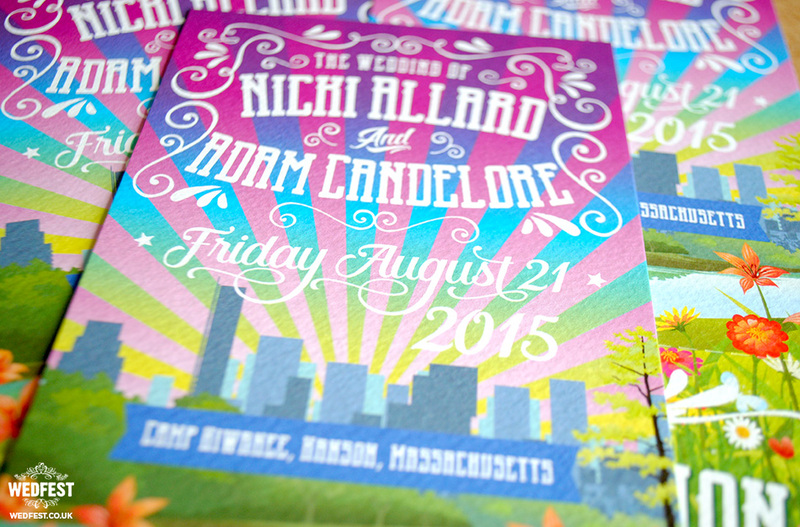 Nicki & Adam from Boulder, Colorado in the USA got in touch looking for us to design them wedding stationery for their music festival themed wedding at Camp Kiwanee which is situated on Maquan Pond in Hanson, Massachusetts. Camp Kiwanee is is a romantic and unique setting with a huge lake surrounded by forest and beautiful nature. The wedding venue itself offers both indoor and outdoor function areas, overlooking the Maquan Pond and the main venue is tucked under towering pine trees, where the wedding and events take place, providing a unique view and ambiance unlike any other. For the wedding guests there are ‘summer camp’ style cabins for them to stay in when attending the wedding. This is where Nicki and Adam where getting married and they wanted to recreate this magical setting in their wedding stationery. 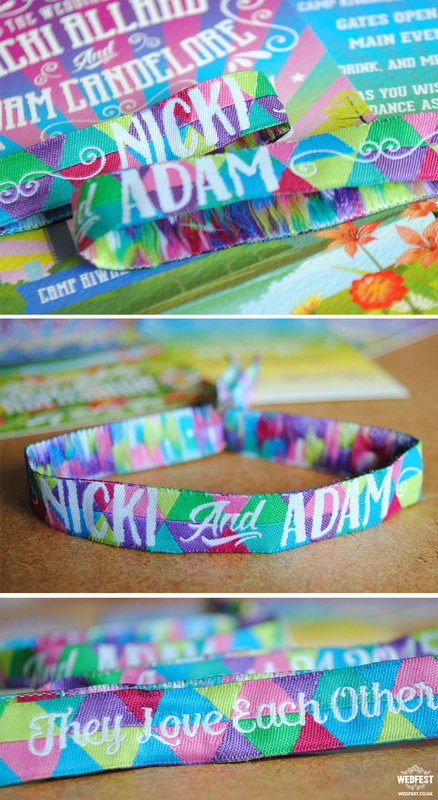 When Nicki & Adam got in touch they explained that they were having a music festival themed wedding as they are huge festival fans and go to as many as possible and that they actually got engaged at Bonnaroo Music Festival. 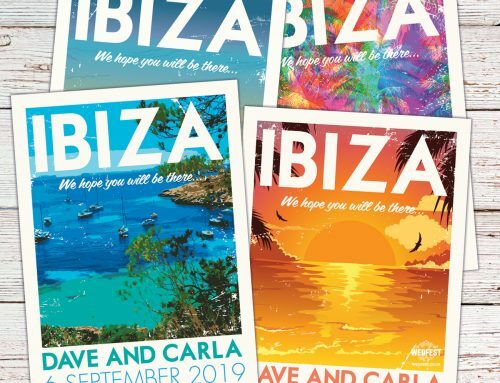 For the style of the wedding invites they sent us lots of music festival posters that they liked for us to draw inspiration from and get a feel for what they wanted. 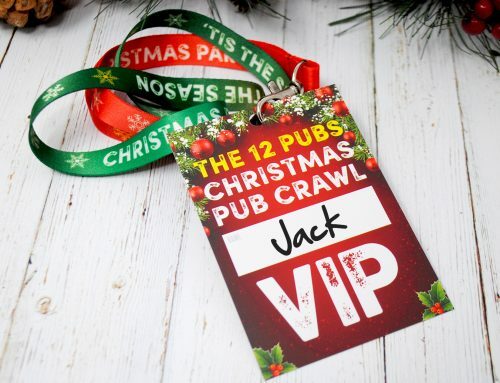 For the wording on the wedding invites they told us they are not traditionalists, and they were hosting a casual event and would like the invites to reflect our personality. On the invites they wanted the wording “Camp out with the Bride and Groom” to let guests know they are welcome to stay the night at the Camp. 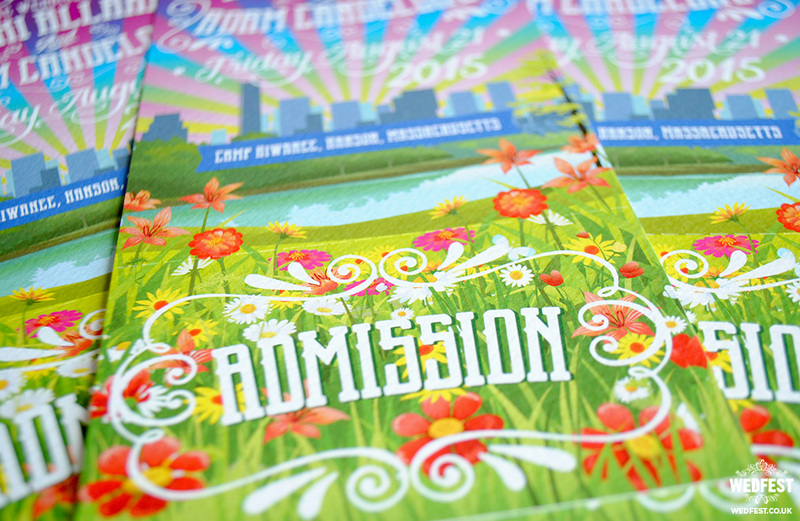 They other main thing they wanted included in the design was the Boston Skyline as Boston is where the couple met and lived for several years so they wanted to include this in their wedding invitation design. With all this in mind we set about designing and the results were beautiful. 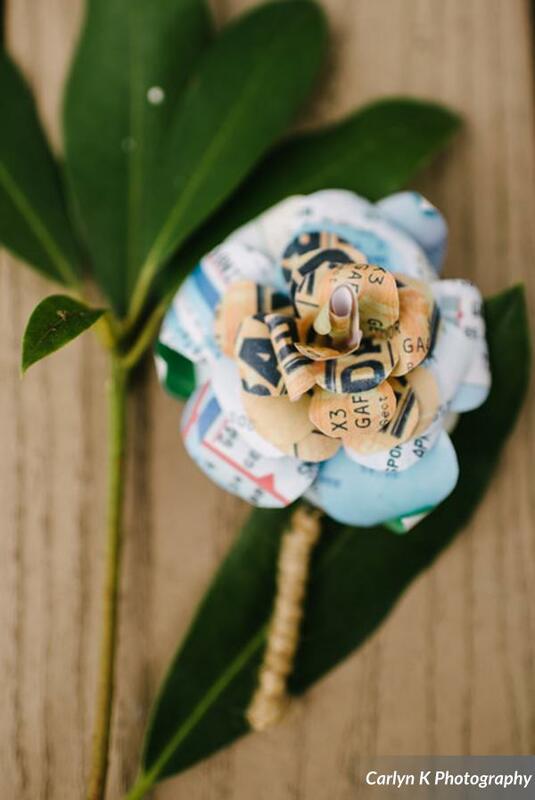 Since the wedding was to take place looking over the lake at Camp Kiwanee we felt this had to be the main focus of the invite surrounded by trees and flowers. 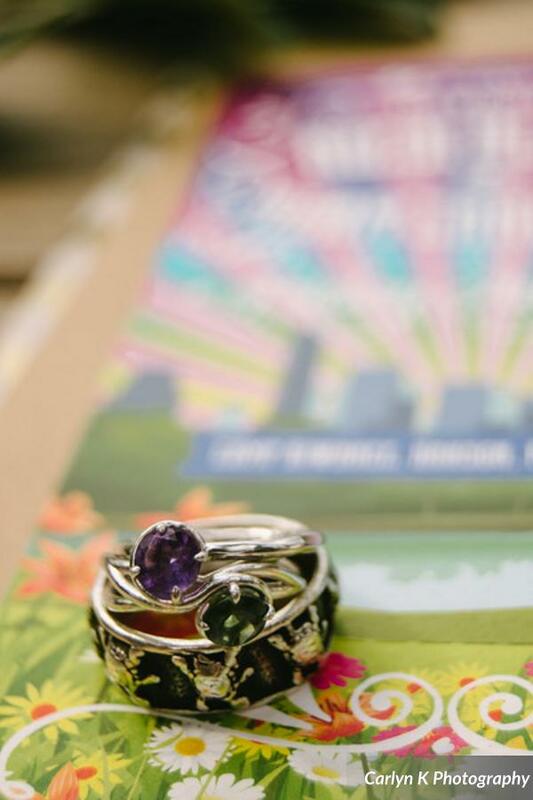 In the distance then you can see the Boston skyline with a technicolor starburst sky. 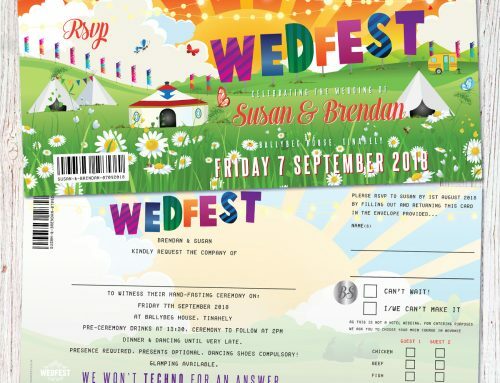 The main details of the wedding invite were designed and laid out like many awesome festival posters, featuring the couples names, wedding date and location on the main body of the invitation and then at the bottom of the invite was the wedding guests ‘Admission Ticket‘ which was also the wedding invitation RSVP Card. 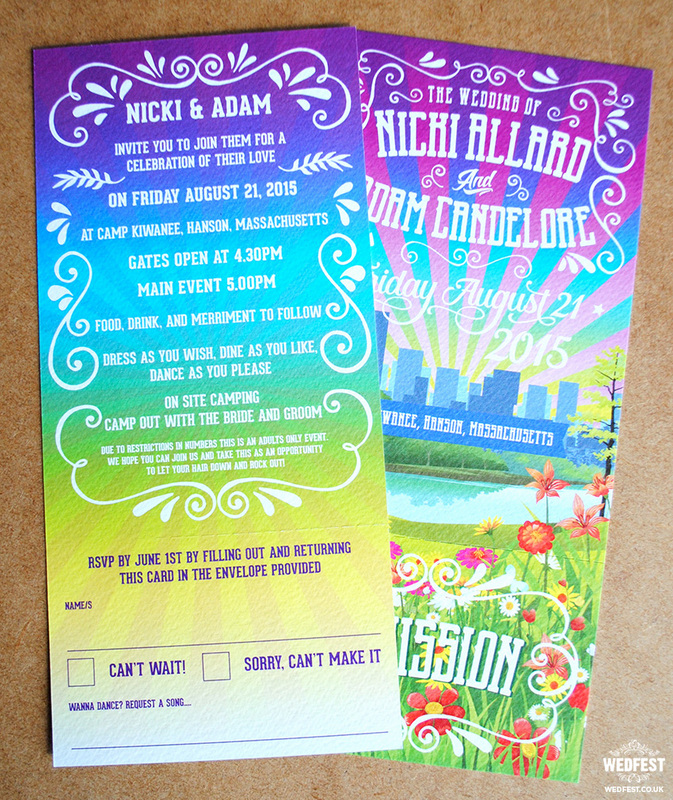 The reverse side of the wedding invites featuring the full details of the wedding and wedding day. 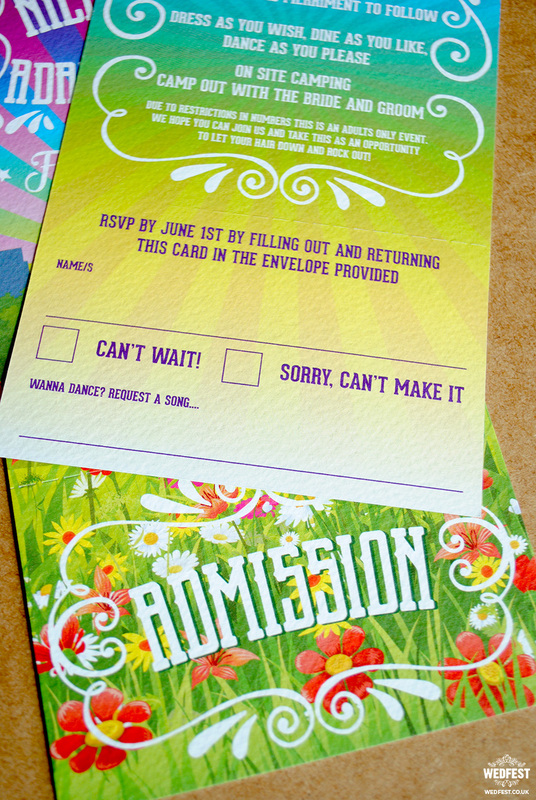 The wedding admission ticket featured the wedding RSVP card on the reverse which let wedding guests tell the couple if they could attend or not and also pick a song to be played at the wedding. 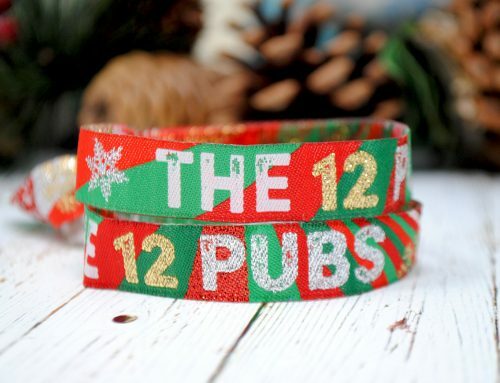 To compliment the festival themed wedding invitations the couple also wanted personalised festival wedding wristbands for their wedding guests which we also designed and made for them. 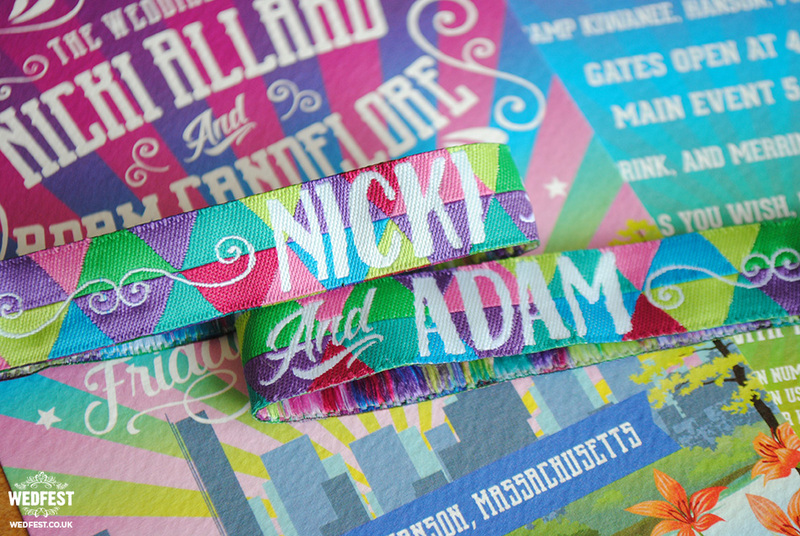 The custom festival wedding wristbands were designed in the same colour scheme as their wedding invites and featured a geometric style design. 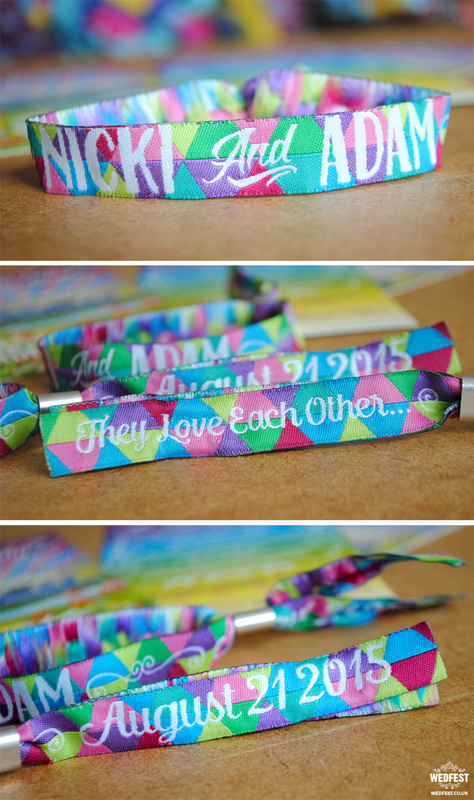 The wedding wristbands featured the couples names, their wedding date and a quote which read ‘They Love Each Other‘. 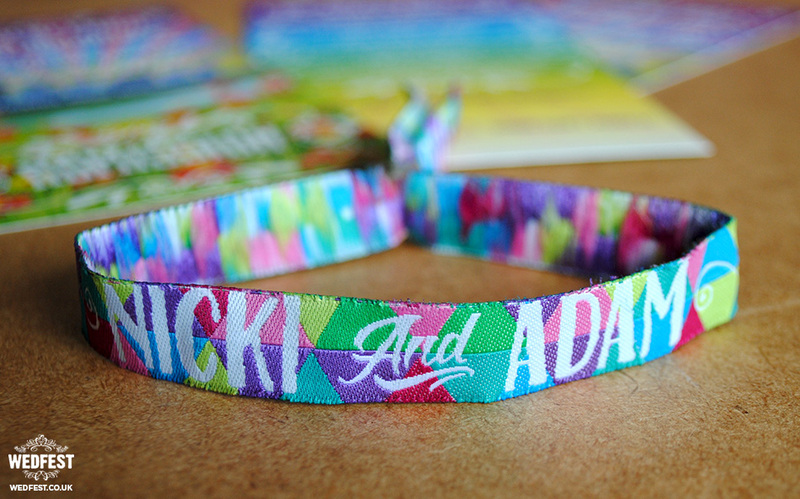 These wedding wristbands turned out super cool as you can see in the photos and were loved by the couple and their wedding guests. 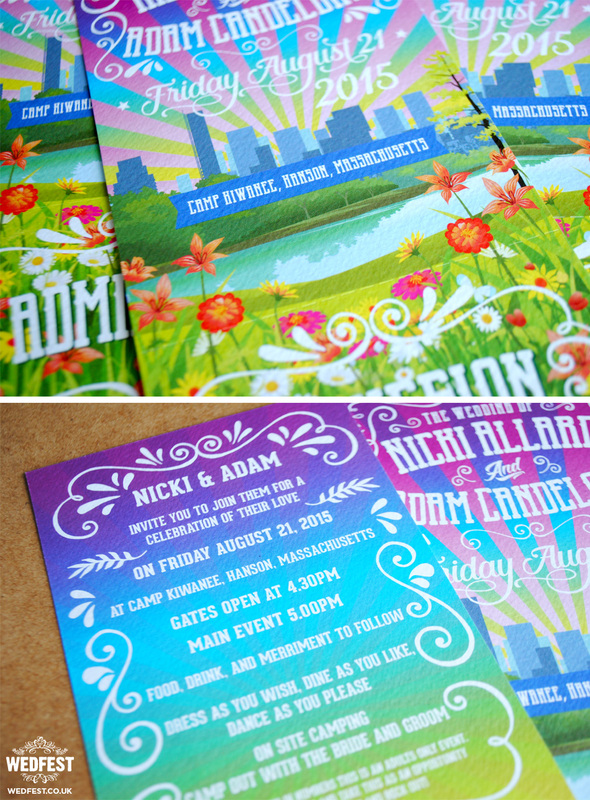 This was a really fun set of wedding stationery to work on and the final results turned out great as you can see in the photos. 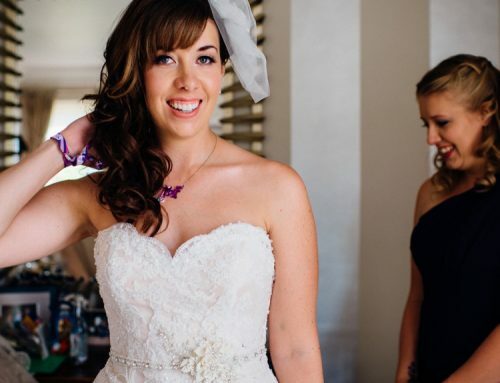 For the rest of their wedding the couple put alot of thought into their wedding decor and the overall look and feel of this wedding was utterly amazing. 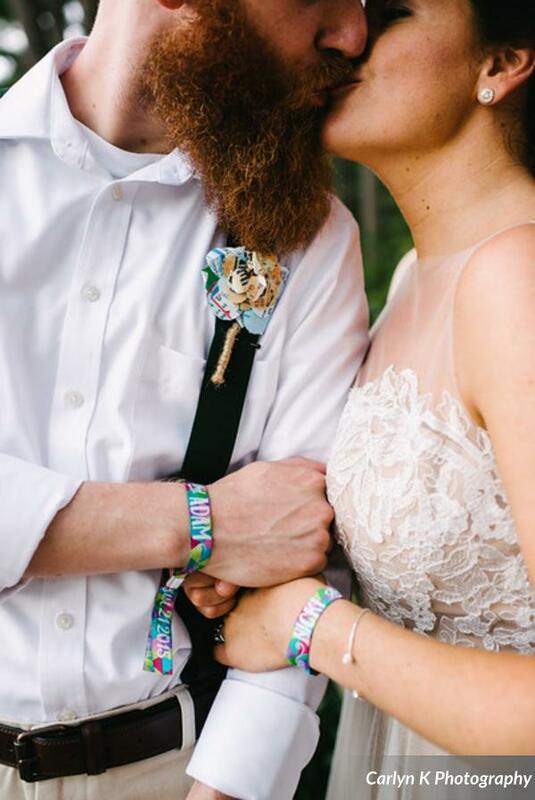 You can see in the photos all of the well thought out and beautiful details from the wedding day. 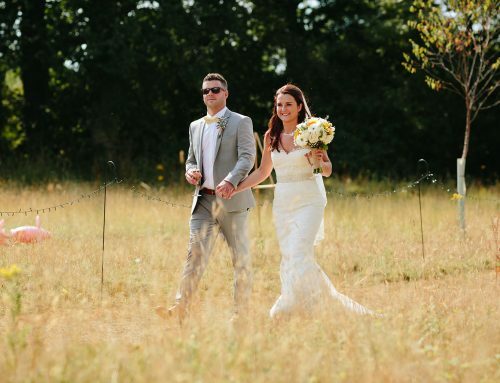 As you can see in the photos below the bride and groom and guests thoroughly enjoyed this wedding and it would be hard to imagine anything else. 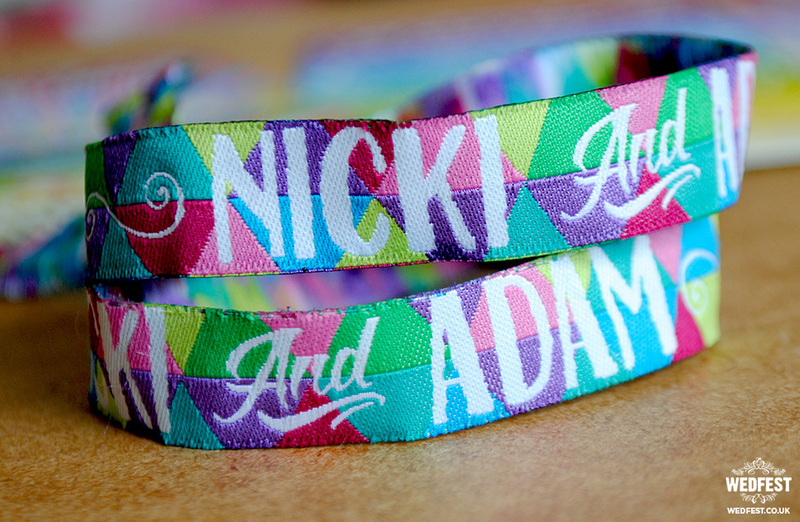 An amazing festival wedding, we would like to wish Nicki and Adam all the best for their future together. 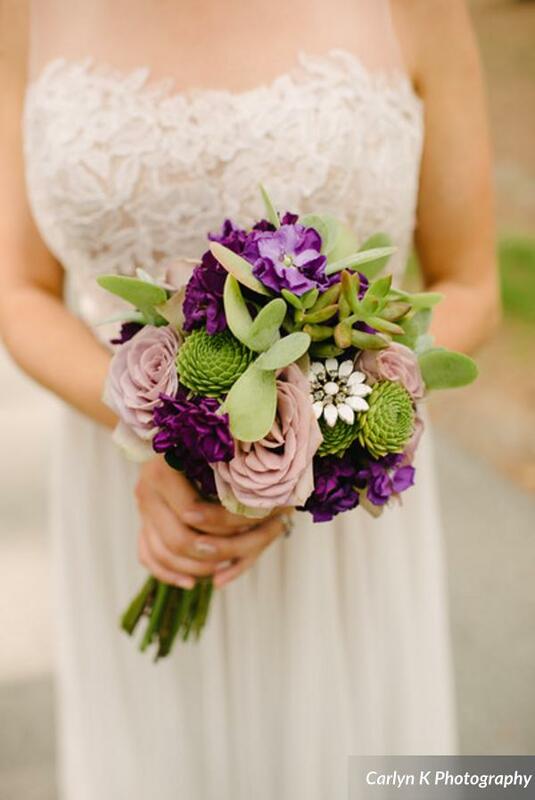 Also thanks to Caryln K Photography for the amazing wedding photography. 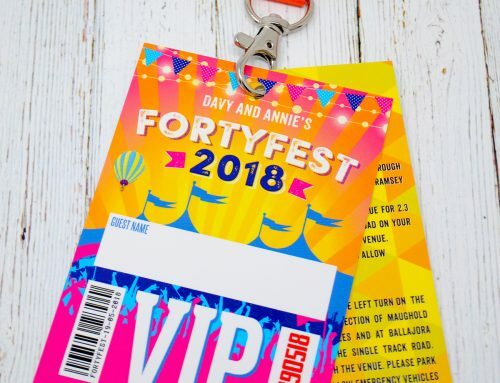 If you like the look of this wedding and would like more information about gettinhg some amazing wedding stationery made for your own big day then please click here to get in touch.